The Floral Design Program is comprised of multiple series and individual classes that focus on subject matter that is critical to succeeding in the floral design industry. The curriculum is outlined below, with approximations of the hours required to complete each series. The Intensive Series combines both the Introductory and Intermediate classes into one wees. This course includes eight design classes and one field trip to New York’s 28th Street Wholesale market. This section of classes introduces foundation level skills of design such as how to correctly handle and care for flowers, use tools such as a floral knife and clippers, and to condition flowers for optimal vase-life. Learn about the hybrid tea roses and other varieties. How are they grown and where. How are they shipped and how does this process effect the price and quality of the product. What characteristics can you expect from the different shipping and growing countries including longevity and flower conditions. Learn about about soft-stemmed flowers; how they grow and who grows the best varieties. How to get them to hydrate and last. Methods of conditioning soft-stemmed flowers. Learn a set of general designs to help soft stemmed flowers keep their shape including manipulating the stems so their best face is always shows and using other materials as aids to hold designs together. Student complete a graphic twisitong design using only soft-stemmed flowers as a test of student knowledge. Learn to start mixing different flowers and textures. How to achieve a chic seemingly garden look while keeping to a strict set of design instructions. Students will learn how to condition hydrangea and the other seasonal elements. The positives & negatives of floral foam and how to use it correctly. The techniques of building a composition so it can be consistent in design and travel well. Each student is responsible to build on arrangement using the above-demonstrated method as a test of student knowledge. Traditioal Dutch method where bouquet is made in the hand. This style and look is reminiscent of classic Dutch still life paintings. Students will learn the methodical construction of making bouquets by having all the stems going in the same direction and evenly distributed. Students will all build Dutch hand tied bouquet of their own as a test of student knowledge. Learn what the wholesale market is and what advantages/disadvantages it provides. Sellers insure competitive prices, larger selection of different flower varieties and consistant product. Students will learn about how to purchase from a variety of sources. Learn how to work with local flower farmer’s and wholesalers workflow and how to manage expectations. How to buy flowers based on cost, quality and location. Students will price out the designs made in the class using actual prices from the day’s purchase as a test of student knowledge. Learn the proper conditioning techniques for the seasonal flowers used in this design. Methods for wrapping and decorating the vase for more modern polished look. Learn to construct an arrangement using the crisscross technique using heavier flowers first to form a more stable grid. Students will learn how to build a palette of similarly toned, monochromactic colors using different varieties of flowers. All students will make the design using the above techniques while seeing the different color and texture variations as a test of student knowledge. Learn about bridal bouquets and the different popular styles. Condition the seasonal flowers used in this bouquet. Use the skills learned in Class 4 and improve on them to make a more polished, professional, balanced bridal bouquet. All stems need to be arranged going in the same direction while blooms need to be at the appropriate height. This class is a focus on detail, color, texture, wrapping styles and bow styles. All students will make the design using the above techniques while seeing the different color and texture variations as a test of student knowledge. Learn how to condition large botanical elements for large-scale floral designs including whick clippers to use and how to use them. How to prune each piece to make sure that it is the right shape for designing. Vase styles and treatments for large-scale designs. Students will learn how to Insert stems into the vase in the spiral fashion to easily manipulate the position and look of each branch. Each student will make a large-scale design with branches, flowers and other elements as a test of student knowledge. Flower Shop simulation. students will make two different floral designs for two fictional parties; one modern and one traditional. Students will learn how to match floral designs with table décor and how to work efficiently while under time restraint. Students must produce consistent designs working in teams; all designs must look the same. Each student is responsible for specific elements of each table design. The Advanced Design Series is a continuation of the Intensive Series where students learn more advanced techniques and develop their own style of floral design. Students will learn four different mechanics of arranging that are commonly used for achieving a specific look. Each student will also be responsible for creating a sketch of the concept and design, picking their own color palette for each instructional technique and selecting their own flowers to best fit their concept. This class will focus on using chicken wire to help build a grid for floral design. Rather than replicating a design like in earlier classes, students will have to develop their own colors and style based on the class lecture. The instructor will coach each student to insure that they are successful. This class will focus on building a tape & grid system for large-scale design. Rather than replicating a design like in earlier classes, students will have to develop their own colors and style based on the class lecture. The instructor will coach each student to insure that they are successful. This class will focus on creating organic containers and how to create cohesive floral compositions. Rather than replicating a design like in earlier classes, students will have to develop their own colors and style based on the class lecture. The instructor will coach each student to insure that they are successful. The Advanced Wedding Series focuses on more advanced skills in the floral arts focusing on the wedding market. It presupposes knowledge of certain techniques such as proper flower processing, basic arranging and familiarity with the florist’s knife, as gained through FSNY’s Intensive Series. This Wedding Series includes step-by-step instruction of four wedding-specific design skills including: handwiring individual flowers for boutonnieres and head wreaths; the design of a cascading bridal bouquet using handwiring techniques; large scale designs for ceremony decor; and the construction & decoration of a Chuppah. Students will learn how to choose flowers for corsages, boutonnieres and head wreaths based on longevity and appropriateness for each application. Hand-wiring techniques will be demonstrated for specific flower types and then applied to each application. Students will take home a head wreath and boutonniere as created in class. Students will learn how to create a modern, cascading bridal bouquet constructed entirely out of hand-wired blossoms. Students will learn how to wire stems to create length, how to manipulate stems and blooms to feature the flowers best features and how to create a lush, cascading bouquet to produce an overall dramatic effect. Students will take home their romantic bouquets! A brief discussion on the meaning and appropriateness of Chuppahs, arches and canopies for wedding ceremonies. Construction of a canopy or Chuppah will be created and students will learn specific techniques for applying flowers to such canopies. The floral canopy will be decorated collectively by the group, weather permitting, in our beautiful outdoor garden space. Photographs of floral designs can often be the only record of a beautiful design. This workshop will give the students the opportunity to understand how cameras work and how to get professional results with their cameras using basic photography principals such as depth of field, shutter speed, ISO and color balance. Following the photography portion of the class, students will discuss the best methods to reach an audience and how to build a brand via content marketing tactics such as social media, press releases and more. In this three-day course, students learn the full process of creating the overall floral design for a wedding. Students begin with creating storyboards, receive instruction in conducting consultations and creating proposals, how to purchase floral product and finally, creating the mock-execution of the event’s designs. Each student is required to develop their own wedding floral designs based on specific client requests and finishes with a mockup table decor and presentation to the “client.” This is a great opportunity for students to practice event production with specific client requests, budgets and of course, flowers. Day Two will focus on flower buying, production and construction of designs. This day will be led by designer Calvert Crary. 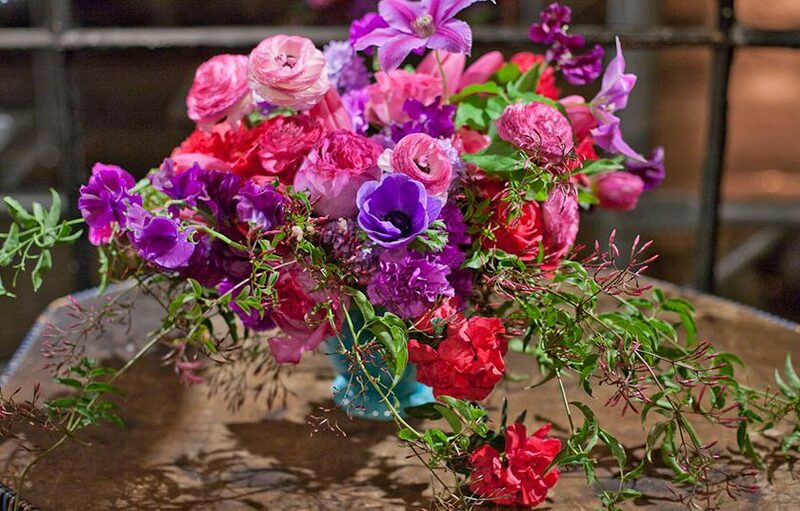 In this class floral designer Meghan Riley will take students through the stages of planning a funeral using flowers as the medium to soothe and comfort the bereaved. Reviewing funeral traditions and treatments from around the world, this class will focus on the meaning of sympathy flowers in a non-cliched approach demonstrating how flowers can send a powerful message during a difficult time. The Flower Shop Series is a four part series that will teach the class the workflow of owning a flower shop and will cover the following subjects. This class is for students with floral design experience who plan to open a retail shop or people who have shops who are looking to expand and redefine their businesses. Understanding the type of business that you wish to have is the first task in preparing to open a shop. Do you want to have a shop that focuses on events (wedding and corporate) or gifts (retail) or a combination of the two? We will provide three working models so that you can visualize the type of business that would a best fit. Upfront costs will be discussed. Section two focuses on preparation for daily orders. Students will be tasked with designing a variety of common requests, ordering the flowers for those designs and making sure they are within budget. Here, we will go over standard pricing practices, presentation, customer expectations and vendor relationships. In the morning of day two, students will start their day operating as they were in a flower shop. The flowers will be conditioned; orders will be filled for specific clients with specific requirements. Finally, we will learn different wrapping styles and demonstrate successful working methods for each. Part four will concentrate on the branding of the business, building a clientele creating a dynamic website and merchandising. Use of social media, networking and advertising will be covered. Providing our students with opportunities in the floral field is an important goal for FlowerSchool NY. We work hard to help our students find real world experiences in order to continue their floral education in the field. We work with several affiliate flower shops and studios throughout the country that offer our students internships ranging from weekends to one month and full year opportunities. Many of our students build upon these experiences to open their own shops or secure a full-time position at an existing studio.